We are dental specialists who have additional education and training in diagnosis, treatment planning, rehabilitation and maintenance of the oral cavity. There are roughly 190,000 professionally active dentists in the USA today in which only about 3500 are prosthodontic specialists. Prosthodontists invest 3 additional clinical years beyond dental school to become specialists. These intense extra years provide us the ability to tackle all simple and complex dental cases and to provide true comprehensive oral evaluations when we see you. More simply stated, we are dentists who specialize in the restoration of broken or worn teeth, replacement of missing teeth, and enhancement of natural teeth. Our priorities include oral function, comfort, appearance, and the health of our patients. We are experienced in treating complicated and unesthetic cases. 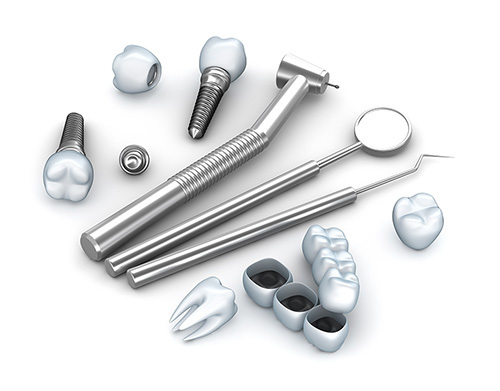 We specialize in fixed, removable, and implant dentistry. Fixed prosthodontics refers to prostheses that are permanently cemented in the patient’s mouth. These usually involve crowns, bridges, and/or veneers that replace broken or missing teeth and enhance the function of the patient’s bite, and improve the esthetics of the smile. Removable prosthodontics refers to either complete or partial prostheses that the patient is able to remove from his/her mouth. This can simplify hygiene and maintenance for the patients. These types of prostheses usually replace the teeth and the gums and also improve function and esthetics to give patients a beautiful smile. Implants may also be combined with this form of treatment to increase the retention and comfort of the prostheses! Implant prosthodontics combines principles of the fixed and removable disciplines to enhance patient comfort, retention, function and esthetics. An implant is a titanium bone anchor which helps secure various restorations. This style of treatment requires the surgical placement of the implant fixtures, followed by a healing phase and then the restoration phase. Implant prosthodontics results in a predictable and comfortable treatment for the patients!